Pete's work schedule has been insane these past two weeks and PJ and I really haven't see very much of him. He has to work for the entire Memorial Day weekend, so we decided to make the most of his day off today and take PJ to the beach for the first time! 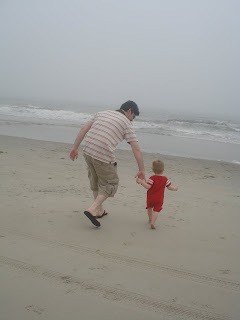 We got to Ocean City and headed right to the boardwalk- this of course, was easy since it was a weekday morning! Parking was no problem at all and the boardwalk was busy but not mobbed. PJ hit the boards running! He loved walking along, looking in shops, imitating the sea gulls (when they screeched, he called back, LOL!) and stoping to examine the nails holding the boards together! 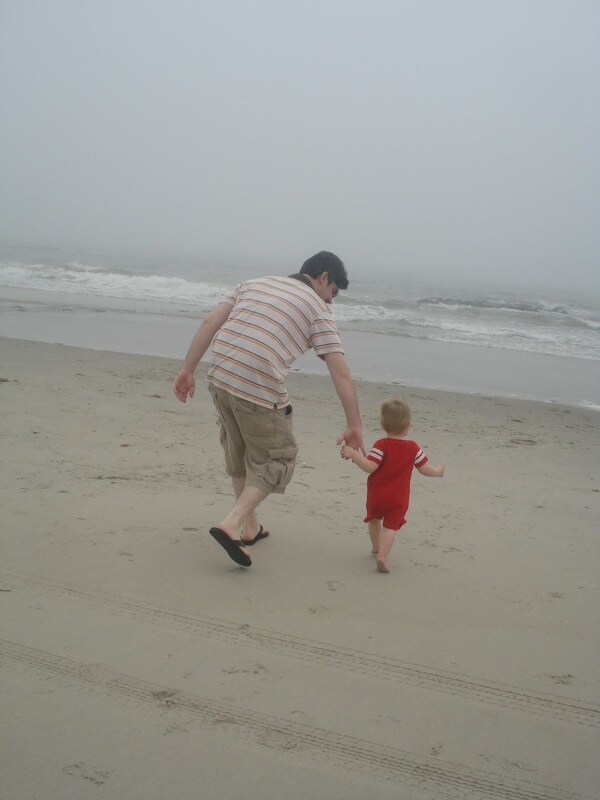 Still, it was nothing compared to PJ's first dip into the ocean! We weren't sure how he would take it, since he can sometimes be sensitive to noise and cold. The ocean, of course, was loud and freezing! But he stomped right across the sand to the waters edge, and when the first wave hit his toes he laughed with happiness! He loved it! Pete and I were so excited! Taking our son to see the ocean for the very first time was a really big deal to me, and PJ's obvious happiness made the day even better! He was awesome from start to finish and it all just reminded me again of how freakin' lucky I am to be his mama! He is also a gigantic ball of energy, and aside from napping in his carseat to and from the shore, he was a moving, bouncing, giggling, screeching, eating, walking ball of enegry all day! He wore this mama out!